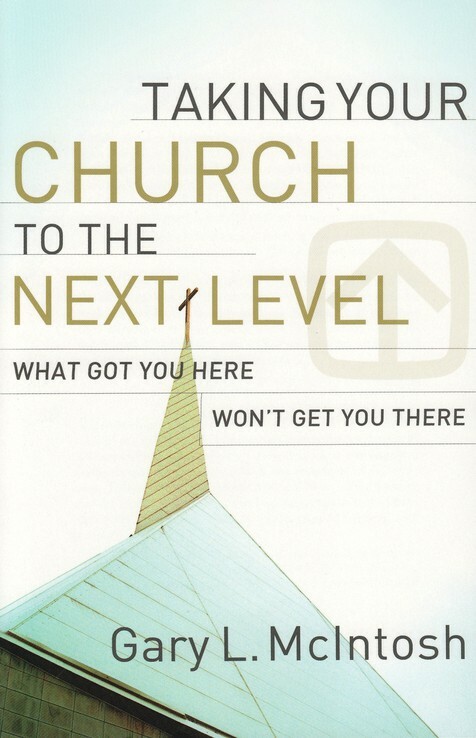 Editor's Note: The following is a report on the practical applications of Gary L. McIntosh's's new book, Taking Your Church to the Next Level: What Got You Here Won't Get You There, (Baker Books, 2009). Has your church stopped growing or even started declining? You can turn the situation around and experience fruitful ministry again. But what got your church where it is now won't be enough to get it to where you want it to be. Taking your church to the next level of growth requires making improvements at each stage in your church's life. Expect change. Realize that your church will never stay the same and plan for the changes it will inevitably experience. As a church grows and ages, its people change, it sees conflicts build, and its programs peak in effectiveness. But if you work to diminish destructive forces and stay focused on your church's mission while renewing its ministry, you can keep it healthy and vibrant. Aim for continual improvements. Since ministry goes through cycles of ups and downs, success in ministry is never an ending but just a point in a cycle that continues year after year. So keep making improvements over time to achieve long-term excellence. Remember that a church's durability comes from: the values that guide the creation of its program and ministry, the development of processes designed to encourage the behavior that reflects those values, and leaders who function as architects of the entire process. ...an emerging church. If your church is fairly new, you need to ask: "Who are we?". Establish practices that will help your church start out as healthy as possible. Make sure that your church has a central driving mission and a vision that empowers your congregation to move into the future well. ...a growing church. If your church is currently growing quickly, you need to ask: "Where should we invest our resources?". Work to make sure that competing agendas between the original members and new members don't derail your church's growth. Seek to unify all church members around a common future vision and plans for using the church's resources to fulfill that vision. ...a consolidating church. If your church is consolidating from a smaller church into a larger one, you need to ask: "Where do we go from here?". Develop intentional processes to connect with and recruit newcomers so they don't get lost in your church's organization. Hire additional staff members. Consider enlarging your church's building, parking area, and grounds, or moving to a larger location. ...a declining church. If your church is losing members, you need to ask: "How do we stop the decline?". Call the congregation back to your church's original mission and develop a new vision for the future. Be willing to suffer the pain of canceling programs and diverting money to new projects. ...a dying church. If your church is in danger of closing its doors forever, you need to ask: "How can we turn this mess around?". Establish a new definition and commitment to mission. Change the congregation's attitude so the laypeople and leaders look to the future with hope and excitement. Change the way you use the church's financial resources. Rework your church's organization to allow for faster decision making, new program development, and greater flexibility. Embrace new ministry approaches, resources, and materials. Find the right leader for each stage. As your church goes through each life cycle, your pastor will need to possess different skills to be most effective. An emerging church needs a catalyzer - a person who has the ability to bring something into being that did not formerly exist. A growing church needs an organizer - someone who has the ability to take a disorderly organization and bring together its jumble of pieces into an orderly form that maximizes its resources. A consolidating church needs an operator - a person who likes to manage a stable congregation by making small incremental changes that maintain the basic systems. A declining church needs a reorganizer - someone who has strong organization skills but can also keep the long-term members happy while building a new vision and agenda for the future. A dying church needs a super reorganizer - a person who can bring about radical changes that result in the congregation's rebirth. Pay close attention to feedback. If your church is growing, that's a signal that the current investment of ministry capital is paying dividends. But if your church is not growing, that's a signal that the ministry capital is losing power and new capital needs to be discovered, developed, and put into place. Pay attention to these five core areas your church's ministry capital: Spiritual resources (the church's doctrine, values, and beliefs; the prayer life of its people; and the congregation's faith in God's mission and vision for the church), directional resources (the quality and experience of the pastor and leadership team; and the commitment of the church members to investing their time, talent, and treasure in the church's ministry), relational resources (the unity, fellowship, and community experienced by the corporate body in groups of various sizes), structural resources (how flexibly people in the church can work together), and physical resources (the value of facilities and property, as well as the church's visibility and accessibility in its current location. Move beyond plateaus. A church will only grow to a certain level and then plateau until more changes push it up to a new level. At each plateau your church reaches, consider making transitions like these: adding staff, delegating ministry and providing leadership training, mobilizing laypeople, expanding programming, adding another worship service, adding classes, expanding facilities, changing the pastor's role, developing new ministries, and reminding people of your church's vision while motivating them to continue to support it. Keep a spiritual focus. Help the people in your church remain authentically connected to God throughout the sometimes turbulent process of change by: praying often, staying focused on the big picture of what God is doing in your church, and remembering that ultimately it's God who causes a church to grow. Adapted from Taking Your Church to the Next Level: What Got You Here Won't Get You There, copyright 2009 by Gary L. McIntosh. Published by Baker Books, a division of Baker Publishing Group, Grand Rapids, Mich., www.bakerbooks.com. Gary L. McIntosh is president of the Church Growth Network and professor of Christian ministry and leadership at Talbot School of Theology. He leads seminars and has written several books, including Biblical Church Growth and Beyond the First Visit.